At the end of your turn, give another random friendly minion +1 Health. She can't wait to learn Power Word: Fortitude Rank 2. Love this card, might not be meta but it's so satisfying when it lands multiple buffs. 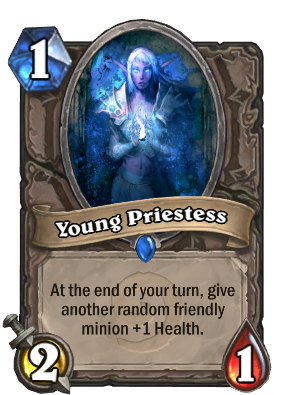 This card is so rare, I hardly sees them in both constructed and arena. Not seen too often, but a decent drop when hidden behind taunts. Decent 1 drop.